It's National Grilled Cheese Month. Yes, that gets all caps. Few things are more sublime than a well executed grilled cheese sandwich. It is, to date, the only food item that has ever brought the paper to a circuit-breaking halt. Our story begins several years ago, when we were in our former building down on West 10th Street. This was in the early days of our annual cooking sessions, a long tradition that continues Thursday with a bratwurst grilling. But that's another story. On this particular day, we were having grilled cheese and vegetable soup. In all, there were about four griddles, four Crock-pots of soup and baskets of homemade bread, an assortment of cheeses. If there's anything we do well, it's put on a spread. So, this was going on around the lunch hour.... in the backshop, which, at the time, is where most of the pages were put together. Lots of electronic equipment working on circuits installed in the 1960s and updated little since then. It's amazing how much power a griddle and Crock-pot legion consumes. Every time one of the griddles adjusted its heat to a higher setting, the boards fried. Computers shut down. It's a good thing none of The Really Higher Ups were in that day, or.... well, it wouldn't have been good. Anyway, Grilled Cheese Day remains one of our favorite cooking events. Although, even in our "new" digs, we're still careful not to overload the outlets. 1. Butter the bread, not the pan. Butter will be more evenly distributed which ensures a properly crisp sandwich. 2. When using dense breads, slice them thinly so that the heat can penetrate and melt the cheese. 3. Grate or shred the cheese; it will melt faster. Melt 3 tablespoons butter in a skillet over medium heat. Add apples, sugar, cinnamon and cardamom; cook about 7 minutes, stirring frequently until most of the apple juices are reduced and the fruit is coated with syrup. Remove pan from heat. Set aside. Place four slices of the bread on a griddle. 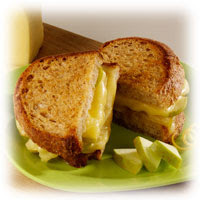 Top each with one slice of Havarti, 1/4 of the spiced apples, another slice of Havarti and top with remaining slices of bread. Butter sandwich tops. Turn over and butter again.Place griddle over medium heat. Brown on each side 3 to 5 minutes, until golden and Havarti begins to melt. Cool 5 minutes before serving. Toss grilled asparagus with vinaigrette and let stand covered and refrigerated, at least 2 hours before using. Reserve. Lay 6 slices of bread on clean, flat surface. Top each slice with (in order) 2 slices Fontina, 3 marinated drained asparagus spears, 2 slices Fresh Mozzarella, 6 fresh basil leaves, 2 1/2 tablespoons red pepper, and 2 slices Provolone. Top with second slice of bread and brush both sides of sandwich with olive oil. Heat a large non-stick skillet over medium heat and grill sandwiches on both sides until golden brown. Transfer to baking sheet and keep warm in 350ºF oven 8 to 10 minutes or until heated through. To prepare chutney, heat oil in a non-stick skillet over medium heat. Sauté onions until beginning to brown. Deglaze pan with vinegar. Add cherries, salt, tarragon, honey and water and simmer for 20 to 25 minutes; cool. To prepare sandwiches, butter one side of each slice of bread. Place four slices of bread, buttered side down, in a large, non-stick pan or griddle on medium heat. 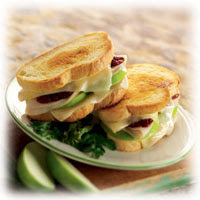 Top each with Fontina cheese, turkey, sliced apple, and 1 tablespoon of chutney. Top with remaining four slices of bread, buttered side out. Grill each side until golden brown and cheese is melted.